Our last day of 2017 Great Race. We made it! 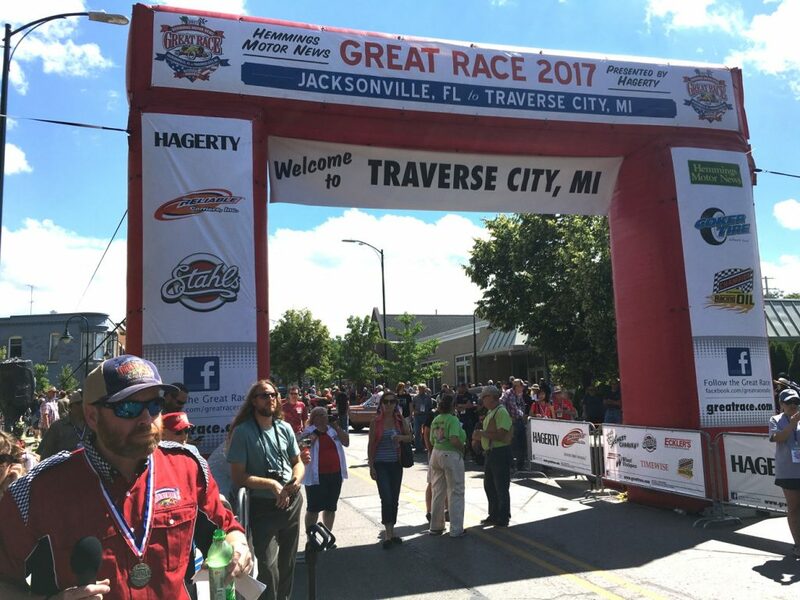 Jacksonville to Traverse City, Nine days that ranged from so hot and sticky that we made our own sweaty rain, to a cool, rainy morning where I seriously considered putting on long pants (for a moment – I got over it). In between, hard rallying, occasional mechanical and one geological challenge, and every challenge met. 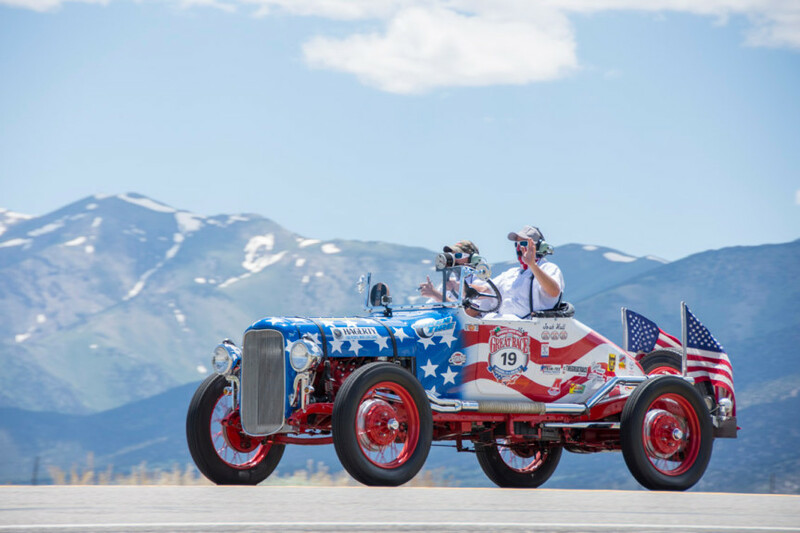 Time spent in shared adventure with our Great Race family, and the hospitality of towns all across our country. What could be finer? Please excuse that I didn’t write this til morning. I’m a little tired. It was our last day, waking in Sault Ste Marie to a 50 degree rain. Bender was running beautifully, so we didn’t need to do much daily prep: just check the fluids and clean the whitewalls for the big finish ahead. The rallying had a few tricky bits, like two checkpoints not more than a minute apart, or a double-deep timed part where both a corner and a speed change need separate timing that overlapped (we didn’t get that exactly right once of two occurrences). But indeed we did make it, though just after the last checkpoint of the race, as if to say, “I’m Done with This!,” Bender’s clutch popped out again!!! Fortunately, it was the same issue and we knew what it was and how to put it back, so the car was up on stands and reassembled in no more than 10 minutes. Then we pressed on, through the remaining local instructions that included 6 stop signs and as many traffic lights and corners – and I only had to use that clutch (EVER so gently) twice. There’s those singing angels gain! At last, we were rolling through the big finish to a cheering crowd (including my wife, Sue and son, Ethan!!!). All finishers receive a Great Race medal there. 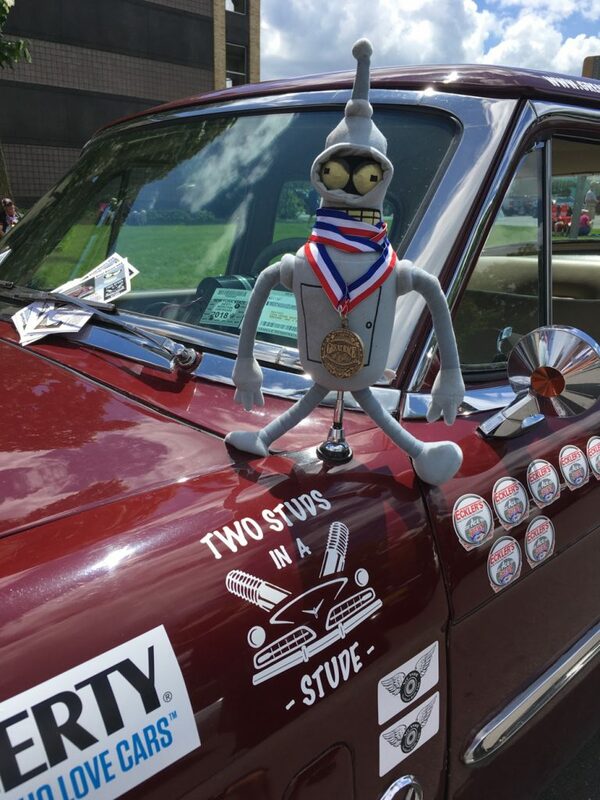 Theresa Coker even awarded a third medal to our hero, Bender! Once everyone was checked in to the Great Wolf Lodge, we were bussed to the State Mental Hospital. Yes, that’s true, and maybe even appropriate, but it’s no longer used for that: it’s now condos and shops! 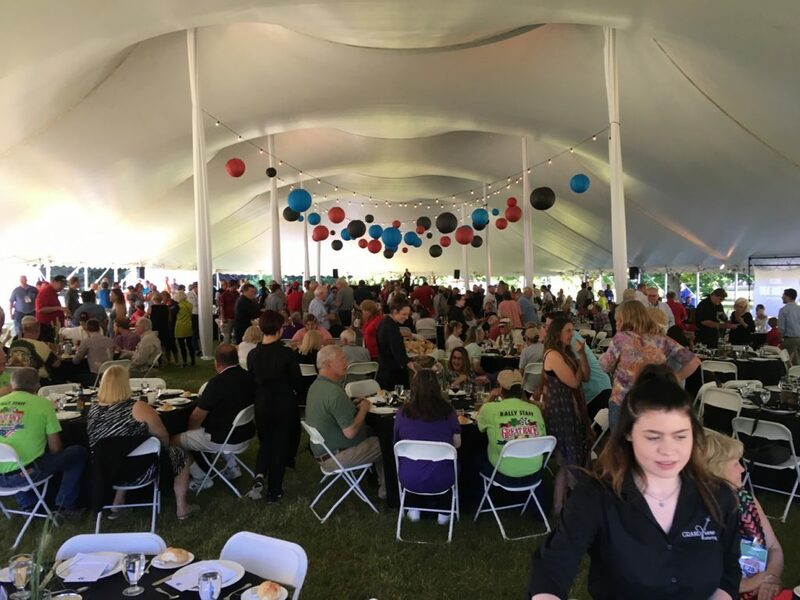 – it’s a beautiful old building on lovely grounds and they had set up a big tent there for our awards banquet. The winners in Rookies were the Gentry girls, Olivia and Genna. Their mom, Beth with her nephew Jody Knowles took top in Expert and the overall Grand Championship, edging out Jeff and Eric Fredette by fractions of a second!!! Jeff and Eric have been there before – they are great sports! I know they’ll be back. 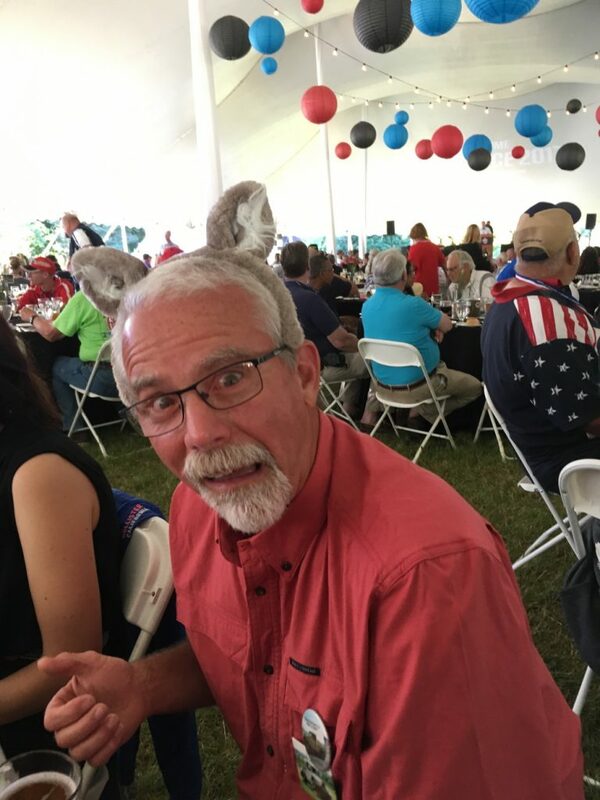 In the meantime, Jeff has gone native with wolf ears from the lodge. 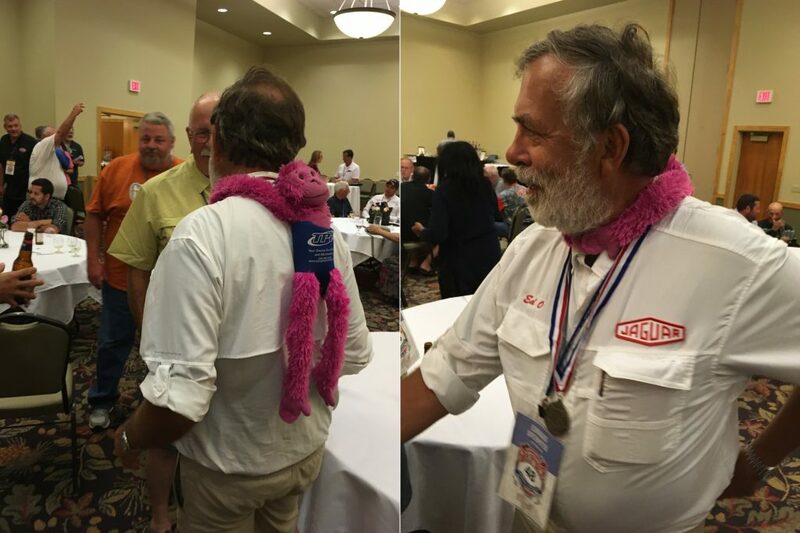 At the afterparty, I was able to pass on the Pink Monkey (from last year’s winner Herb Clark). 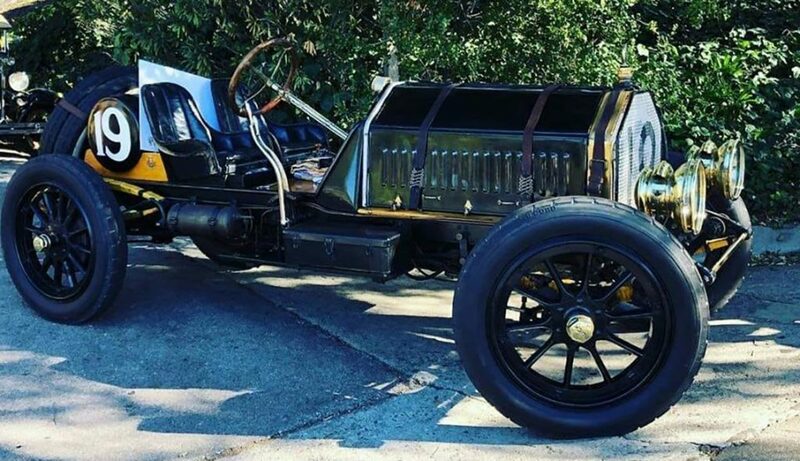 Though some suggest it might have gone to Team Bender, I insisted that there is a lifetime limit on that award and presented to Ed Overmeyer, in his E-type Jaguar. 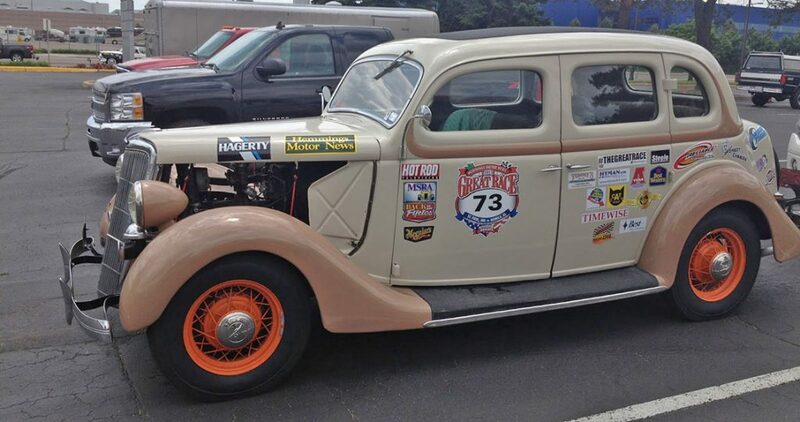 He had differential failure and replaced the entire rear end with another run to him from his home in Chattanooga. Then he lost the hydraulic cylinder for his clutch and a second day of rally while that was sourced and replaced. Pink Monkey, the symbol of perseverance over troubles in finishing the Great Race, well earned. 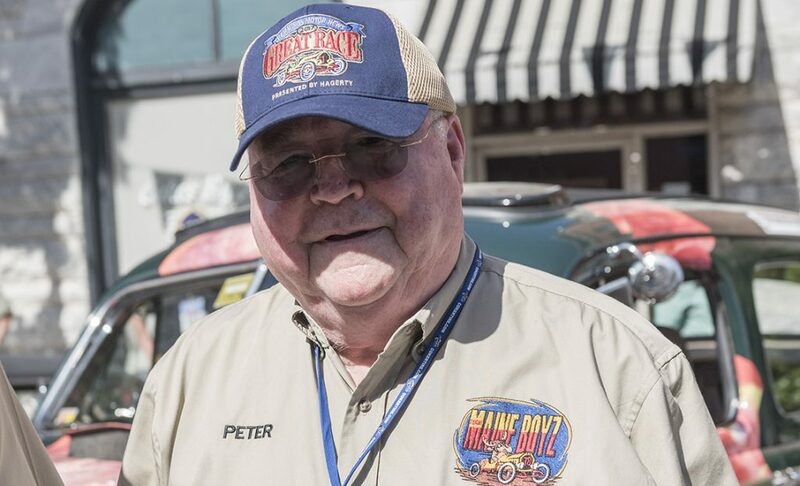 This morning, I will stop at the Hagerty garage to make a more permanent fix to the clutch linkage, and check the deeper fluids (transmission and differential) before Sue and I head up to meet friends in a bit north, stay on Mackinac island to get reacquainted, and then head ol’ Bender gently homeward. What a run. Despite our difficulties, we won our Sportsman division two days of nine! We got seven Aces. WE even scored as high as 5th overall one day! And we had fun. 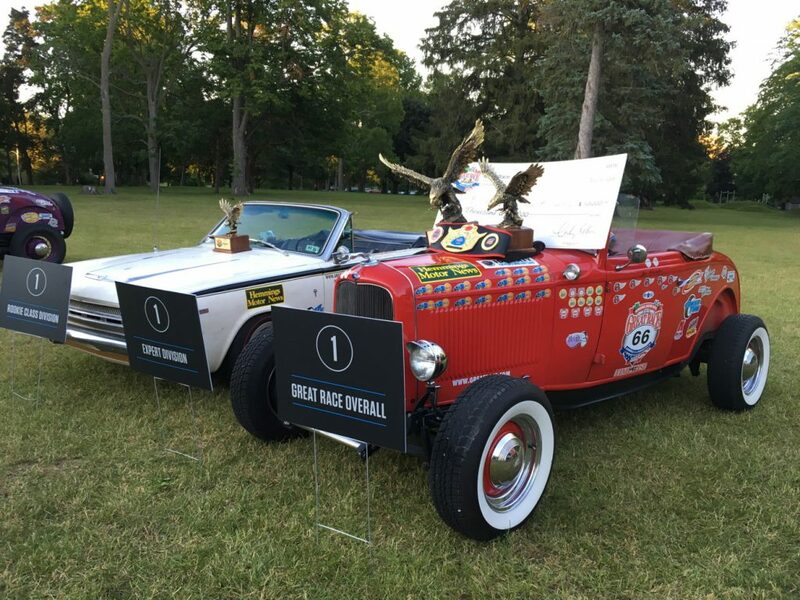 Thank you Ace Navigator and friend, Dale Kasson. Thanks, Great Race. Thank, friends. See you next year! Safe travels home to all!